If your desk is now overrun with wires running between your laptop's power, HDMI, USB and Thunderbolt port, Intel hopes to bring some relief to your tangled reality in 2016. Intel will support Rezence wireless charging, said Kirk Skaugen, Senior VP and GM of Intel's Client Computing Group. Unlike more popular competing inductive wireless charging standards, like Qi, Rezence doesn't require you to line up your devices perfectly with the charging plate, Intel executives highlighted as a benefit of the Rezence solution. The standard will be supported by Intel's Cannonlake and Kaby Lake architectures, and wireless charging will start to appear on systems shipping in the second half of 2016, Skaugen told techradar ahead of Skylake's launch in San Francisco, California. Unfortunately, this means that you'll need new hardware. The wireless charging will be built into the keyboards of laptops and the keyboard docks of two-in-one convertible systems. 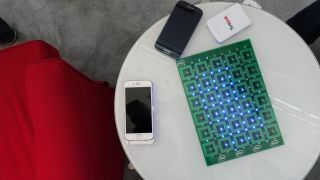 In a demo at IDF 2015, Intel executives showed that the charging plate could be mounted under table tops and doesn't require you to embed the plate within the table surface, saving cost. Once electronics, like laptops and smartphones, are placed on the table, charging begins. Essentially, you'll have one wire connecting the charging plate to your power outlet, but you won't need to plug in your devices to power cords once you have OEMs build in Rezence charging receivers into their devices. Wireless charging is the last component of Intel's vision for a world without wires. Skylake will help users shed wires from their devices. Intel's sixth generation architecture will come with support for wireless display, docking and conference room technologies through WiDi, WiGig and Unite, respectively. We've already begun to see these technologies appear with Broadwell-based systems, but Intel promises that more models will be coming. WiDi will essentially allow users to ditch the HDMI or video output cable on their systems. It will allow you to mirror your laptop's display on a larger monitor without wires. WiGig is an extension of that, and the protocol is currently supported on select Broadwell systems from Dell and HP, Intel executives told techradar at an IDF 2015 demo. WiGig allows you to connect your USB peripherals and display to a WiGig hub. Once your laptop is within proximity of the hub, it will recognize your peripherals and displays so you don't have to plug these accessories directly into your laptop's ports. Your laptop will recognize USB flash drives, hard drives, keyboard, mouse, printers, monitors and other accessories that are plugged into the WiGig hub. For security, only one laptop can be connected to a WiGig hub at a single time. The last part of the technology is Intel Unite, which allows you to collaborate and share your screen wirelessly in a conference room. It also allows remote conference participants to share their screens and log into a conference room when they're at a different location. Through these technologies, Intel hopes to free your laptop from its tethered chains on your desk. There will still be wires, but those wires won't have to be connected to your tablet or laptop. Instead, they'll run through the WiGig docking station or to the Rezence charging plate. Read our coverage of IDF 2015.